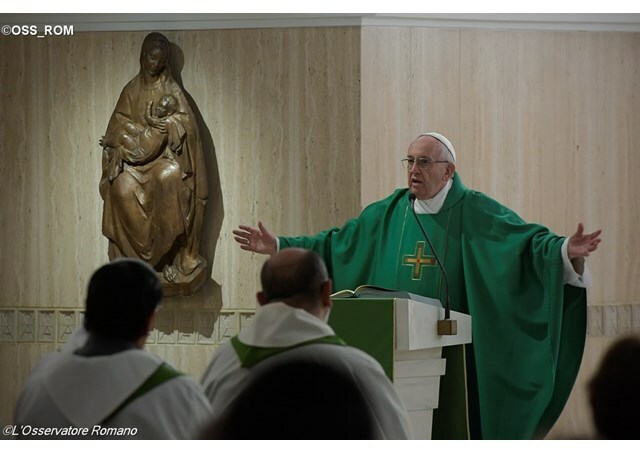 At the Mass Thursday morning at Casa Santa Marta, the Pope warns against the sin of “murmuring,” which is a part of our daily life. And he reminds us that the logic of the Gospel is contrary to the logic of the world. ‘We’ll let this one perish, and in the balance it will result in profit and loss, and we will save these.’ This is the logic of the doctors of the law. ‘Which one of you?’ And their choice is the opposite of Jesus’. For this reason, they do not go to speak with sinners, they do not go to the tax collectors, they do not go because ‘it is better not to dirty myself with these people, it is a risk. Let us save ourselves.’ Jesus is smart in asking them this question: He enters into their casuistry, but puts them in a position contrary to what is right. ‘Which one of you?’ And not one of them says, ‘Yes, it’s true,’ but all of them say, ‘No, no, I would not do it.’ And for this reason they are unable to forgive, to be merciful, to receive.